Check out this beauty. I ran into him on one of my daily walks on the pecan farming roads in Las Cruces, NM where we live now. 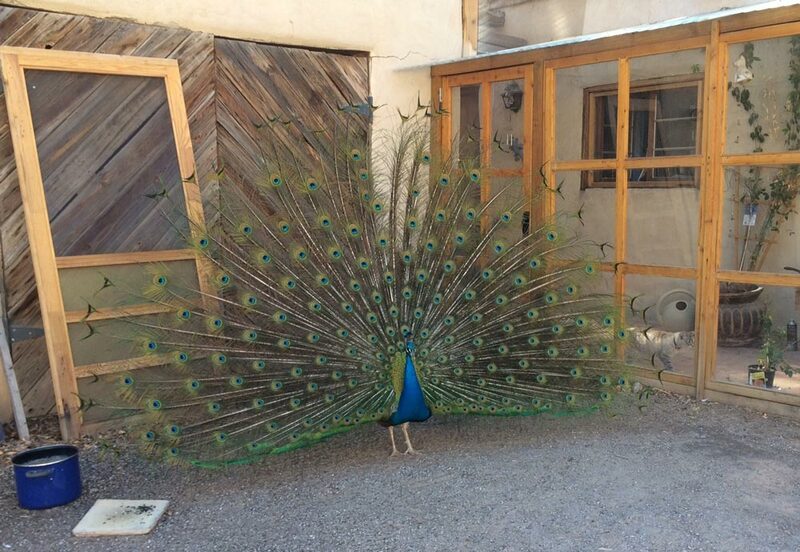 Who knew that peacocks hang out in New Mexico? I was walking by my new friend Bob’s old adobe house and this fine fellow caught my eye. If you look to the right by the pottery, you can see a nice gray kitty walking by in the inside porch. Wow! This is awesome and I am so jealous that you have no snow!! Loved your walking post too, gave me heartfelt inspiration. Go Debbie (and Paula). Thank you, Deb. Come on down! holy moly! now that’s a true gift. terrific shot, btw! Thank you, I have never been so close to a peacock before. They positively shimmer with irridescence! Last March, I was in Naples, and ran into a gator! yikes — glad he was going slower then me! Good gawd, I think I would be so scared I’d stand stark still…..! A gator, I think I would have stood frozen in fear! Yesterday there was a 5 foot long snake sunning himself on the bike trail. I didn’t even have the guts to ride beside him – I took the LONG way around!